The holy, glorious and all-laudable Apostle Thomas is included in the number of the holy Twelve Apostles of the Savior. He is commemorated on October 6 and on June 30 with the Synaxis of the Glorious and All-Praiseworthy Twelve Apostles of Christ. Some icons depicting this event are inscribed "The Doubting Thomas." This is incorrect. In Greek, the inscription reads, "The Touching of Thomas." In Slavonic, it says, "The Belief of Thomas." When St Thomas touched the Life-giving side of the Lord, he no longer had any doubts. What is more, in the English language, the nickname of "Doubting Thomas" can convey the false impression of Thomas as being timid, lacking the full conviction of faith, or even being cowardly; this concept of Thomas is neither historical nor Biblical, except in consideration of the vitally important moment in which Thomas touched the Resurrected Christ; the momentary sinful fluctuation in faith being spectacularly reversed through Divine Grace as an opportunity to validate the bodily Resurrection. In John 11:16, Thomas expressed a desire to die with the Lord, in response to the other disciples' fear that the Pharisees would seek to kill Jesus should they re-enter Judea. The notion of Thomas as wavering or pusillanimous in his faith can be further dispelled in light of the Church Tradition regarding his evangelism, according to which, the holy Apostle founded Christian churches in Palestine, Mesopotamia, Parthia, Ethiopia and India. Church Traditon also indicates that Apostle Thomas baptized the Magicitation needed. 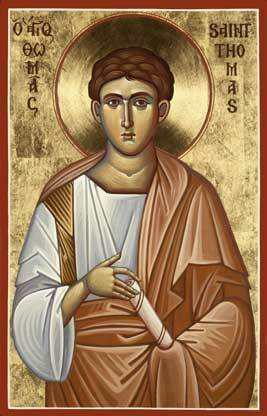 Preaching the Gospel earned the holy Apostle Thomas a martyr's death. For having converted the wife and son of the prefect of the Indian city of Meliapur (Melipur), the holy apostle was locked up in prison, suffered torture, and finally, pierced with five spears, he departed to the Lord. Part of the relics of the holy Apostle Thomas are in India, in Hungary and on Mt. Athos. The name of the Apostle Thomas is associated with the Arabian (or Arapet) Icon of the Mother of God (September 6). Due to his evangelism in Syria and Persia, the Holy Apostle is highly regarded within the Eastern Orthodox Church of Antioch, the Church of Antioch (Syriac), and in the Assyrian Church of the East (which separated from Orthodoxy during the Nestorian schism). The Christian community in India is known as the St. Thomas Christians on account of the tradition that holds St. Thomas as their founder; a dispute over the precise nature of this evangelism, and whether or not Thomas personally ministered within India, resulted in a schism between the Syriac Orthodox Church and the Malankara Orthodox Syrian Church. An important early tradition concerning Thomas, that is of particular importance to Syriac Christians, is the story of the , and which is connected in Eastern Orthodoxy with the tradition of the Icon Not Made by Hands. In recent years the image of the Holy Apostle has been further mired by the media attention given to the recently discovered heretical Gnostic Gospel of Thomas, part of the Gnostic Texts of Nag Hammadi, and also the Gnostic Infancy Gospel of Thomas. These Gospels are associated with the Gnostic heresy, and no Orthodox church regards them as being Canonical; additionally, they are almost universally considered to be pseudepigraphical, even among non-Orthodox Bible scholars. Cyril of Jerusalem attributed the Gospel of Thomas to the Manichees, saying of it "Let none read the Gospel according to Thomas: for it is the work not of one of the twelve Apostles, but of one of the three wicked disciples of Manes." Likewise, the Infancy Gospel of Thomas is generally considered to have been written no earlier than the second century (Irenaeus of Lyons may have referred to it in his seminal work Against Heresies). Thus, it is important that the Orthodox faithful reject any attribution of either of these heretical works to the Holy Apostle Thomas. The Apostle Thomas should therefore be considered not merely as "Doubting Thomas", but rather, as someone whose faith did waver at one crucial moment, yet through the divine grace of Christ, this wavering was reversed into an opportunity for the demonstration of the actual bodily resurrection of the Lord, and for the concomitant scriptural refutation of Docetism and the Gnostic heresy. The false association of Thomas with Gnostic heretical works is all the more extraordinary in light of the fact that his personal experience, as recorded in the Orthodox, canonical, Gospel of John, discredits the Gnostic heresy that lies at the heart of the works allegedly authored by Thomas. In addition to having been the instrument by which the Lord disproved that pernicious heresy, through a remarkable application of grace reversing a sin into a moment of divine revelation, the Apostle Thomas should also be remembered as a great evangelist; just as Peter and Paul made their way to Rome to evangelize the gentiles therein, and Andrew proceeded to the Northwest, Thomas ventured East in order to spread the same Gospel of peace. And a member of the divine college of Apostles. Having been weak in faith you doubted the Resurrection of Christ. Pray now to Him, O all-praised Thomas to grant us peace and great mercy. This page was last edited on October 24, 2013, at 21:35.